Extracorporeal knotting techniques have evolved for a diverse variety of laparoscopic purposes. First, they can be utilized to secure hemostasis of the anterior abdominal wall (106). Best described as a "sling suture" technique, the utility in stopping active hemorrhage from trocar sites has been demonstrated by several authors. The technique of sling suturing extracorporeally, includes both straight and curved needles of various sizes (107). For control of anterior abdominal wall hemorrhage, a transverse ligature is necessary to encompass the area of the vessel. The first stitch should be below the vessel if the culprit is from a lower abdominal trocar injury and above if the injury is upper abdominal. The trocar should be removed only after the control of hemorrhage. Alternative maneuvers may be necessary to control trocar site bleeding, including, but not limited to, percutaneous fulguration (resectoscope), transportal placement of a Foley catheter for direct pressure application, and others. This extracorporeal knot can also facilitate intra-abdominal visualization by "slinging" obstructing structures out of the visual pathway. Nathanson and Cushierie utilized just such an extracorporeal knot as a "falciform lift," and the same can be done with the urachus. Recently, several extra-corporeal-assist mechanisms for passing these sling sutures have been marketed (Fig. 4). These instruments are primarily being marketed for use in visually-assisted fascial closures (Fig. 5). Extracorporeal knotting has had its most common application with loop ligation techniques. A variety of loop knots are utilized and the laparoscopic surgeon can use pretied ligatures or tie one with standard sutures. Several knot configurations are also available and the surgeon can utilize fly-fishing knot variants or sailor's knots for the same purpose (5). Clinically, the most commonly utilized loop ligature still employs the Roeder knot (108). The Roeder knot can be applied pretied as a loop ligature or can be tied after needle ligature intracorporeal placement and then synched (Fig. 6) (35,53). 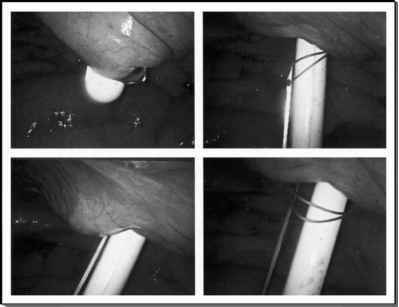 The only investigation on the safety of vessel occlusion reported that dry gut Roeder knots provide vascular occlusion up to 3-mm arteries (107). The other knot configurations that have also been successfully employed include the Duncan knot (with or without a half hitch), Fisherman's clinch knot, jamming loop knot, and Weston's configurations (Fig. 7) (67,111,112). Loop ligatures by design can incorporate any of these aforementioned slipknot modalities. Several manufacturers offer prepackaged, slipknot loop ligatures. Common features include a variable length pusher (usually 80 cm) over monofilament or braided sutures. Application of pretied slipknot loop ligatures has been simplified by disposable applicators. Chromic gut, plain gut, polydioxanone (PDS™ and PDSII™), silk, polyglactin (Vicryl™, Dexon™, or Polysorb™), and dacron (Surgidac™) are all clinically available laparoscopic suture materials. The endoscopic loop ligature is passed backward through a reducer sleeve (3 mm) and then into the appropriate trocar (Fig. 8). The pushrod is then advanced until the loop is fully opened within the abdomen. 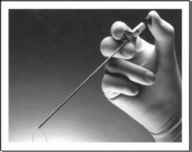 A grasping instrument is passed through the loop and the targeted tissue is grasped. The back-end of the plastic pushrod is snapped and the rod advanced to tighten the slipknot. The synching suture is cut at least 2 cm from the knot. FIGURE5 ■ Visually-assisted fascial closure with through-and-through stitches. eXit™b puncture-closure device shown here. Source: Advanced Surgical, Princeton, NJ. FIGURE 4 ■ EndoClose™ needle carrier can be used to sling or lift structures out of the field of view, close fascial defects, or stop bleeding from anterior abdominal wall vessels. Source: U.S. Surgical Corp., Norwalk, CT. FIGURE 6 ■ Application of Roeder slipknot loops. (A) Technique of applying pretied loop ligatures. (B) Technique of tying Roeder slipknot extracorporeally. Completion of the extracorporeally tied Roeder knot. FIGURE 7 ■ Other types of extracorporeal knots. (A) The Weston II. (B) The fisherman's clinch. The fisherman's clinch has also been utilized for throwing intracorporeal knots using straight needles or pin-vise needle drivers. 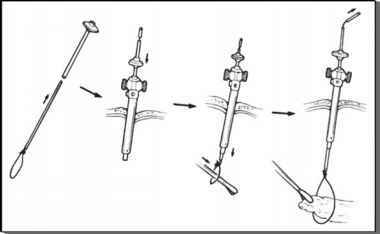 FIGURE8 ■ Steps in successfully passing and applying endoscopic loop ligatures. FIGURE 9 ■ Oko's operating room. Laparoscopic ligator. Allows extracorporeal knotting and nonderailing of sutures during trocar passage. 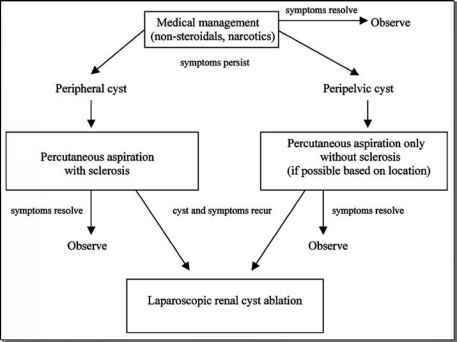 Source: Courtesy of Dr. Oko and G.U. Manufacturing Co., London, U.K.
can be applied fairly quickly (less than five minutes) (109). Any available suture material can be utilized for these extracorporeal techniques, providing that adequate length is available to traverse the trocar (usually 80 cm). Various braided sutures do not slide as well as others if standard square knots are utilized, and should be avoided. Prepackaged endo-scopic ligatures with variable needle configurations are available for this purpose from most manufacturers. One unique approach to this technique employs a specifically designed knotting instrument. Oko and Rosin report the ability to suture and place knots with almost any material and then adjust tension and knot position with their device (Fig. 9) (113). The same type of knotting technique was described by Puttick et al., utilizing a laparoscopic Babcock clamp (114). A multitude of manufacturers tout their knot pushers for ease of synching. The primary problem with all techniques of extracor-poreal knotting includes the need to maintain long suture tails, multiple passages via trocars, no direct control of the sutures at the tissue while knots are being thrown, and the need to suture intracorporeally. Kennedy has shown that multiple extracorporeally tied knots can be sequentially thrown with the aid of a pusher, thus simplifying the reentry problems (115). Complex urinary reconstructions typically require end-to-end or layered closures, which are nearly impossible using extracorporeal techniques. Prior to addressing intracorporeal suturing and knotting techniques, mention should be made to those who advocate clips to secure the intracorporeal suture or suture line. Although not an extracorporeal technique, the primary claims of those exploring this method of suture anchoring are avoiding the potential loosening of slipknot ties or the cumbersome multiple trocar passages required by extracorporeal knotting. TABLE3 ■ Barriers Limiting Rapid Metallic and absorbable clips have been successfully used to secure intracorporeal sutures (116). Metallic sphere clips have likewise been devised to more securely maintain suture tension. There exists only one study evaluating the security of these differing modalities to secure a suture. Utilizing a tensiometer, distraction forces were measured following a standard three-throw knot versus titanium clips versus locking polyglactin clips versus malleable collars. No technique approximated the security of the standard three-throw knot. By doubly throwing the suture through the collar, the distraction force approached that of the knot [knot 4.9 kg (SD = 3.22) vs. doubly thrown collar 5.4 kg (SD = 3.22)] (116).